As demonstrators in Bahrain and Libya attended funerals and faced armed soldiers, campaign groups in Britain called on its government to re-evaluate whether it should be so heavily involved in the training of Arab police and the military. In the past two years, British police have helped to train their counterparts in Bahrain, Libya, Abu Dhabi, Qatar and Saudi Arabia through schemes run by the National Policing Improvement Agency (NPIA), which organises overseas training. At present, there are three full-time advisers working with the Bahraini police, which was heavily implicated in the violent crackdown on protests in Manama this week. 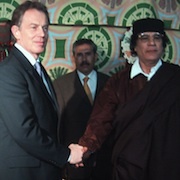 Since the warming of relations between Libya and Britain, officers travelled frequently to Tripoli between 2008 and 2009 to train police, and Britain has authorised the export of tear gas, crowd-control ammunition, small-arms ammunition and door-breaching projectile launchers. Three years ago, ministers agreed to send Libya vehicles armed with water cannons. There are also unconfirmed reports that riot vans made by British companies have been present during crackdowns in the Libyan city of Benghazi, where scores have been killed. And there is the long-standing connection between the British military and Arab regimes that send scores of officers through training at Sandhurst. Five Arab heads of state are Sandhurst alumni, including the King of Bahrain, Sheikh Hamad ibn Isa al-Khalifa, who ordered the violent crackdown. Other Arab rulers who have been through officer training in Britain include King Abdullah of Jordan, the Emir of Kuwait Sheikh Saad al-Abdullah al-Salim Al Sabah, the Sultan of Oman, Qaboos bin Said al Said, and the Emir of Qatar, Sheikh Hamad bin Khalifa Al Thani. Tom Porteous, the UK director of Human Rights Watch, urged a government review of such close links after the attacks on peaceful protesters in Libya, Yemen and Bahrain. “It is a real concern and highly symbolic of the cosy and powerful relationship that countries like the UK and the USA have had for many years with these deeply repressive regimes,” he said.